On October 21st of 2017, Plantón Móvil made its debut in Saint Paul, Minnesota. If you’re unfamiliar with the Plantón Móvil movement, it’s an international community-based march to promote green environments in one’s neighborhood. 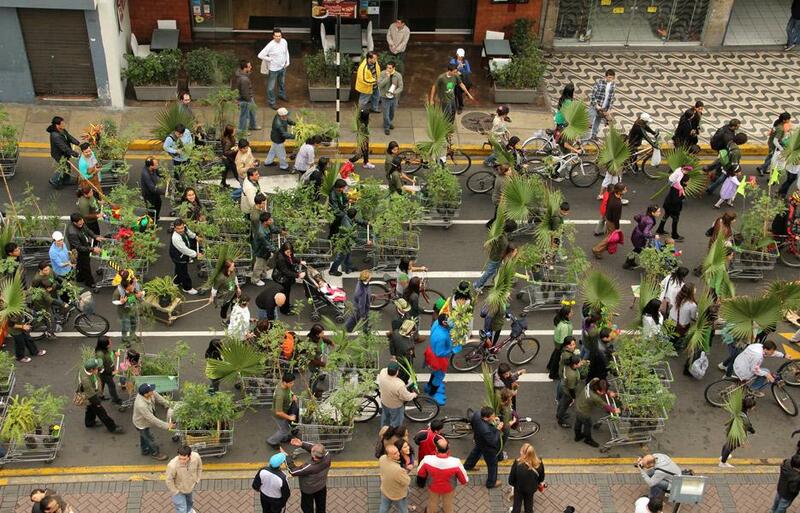 Participants march with plants strung to their bodies, on bikes, in backpacks, and anywhere they can fit. This approach gives the illusion of a walking forest as people stroll along streets. At the end of each march, plants that participants have carried are planted in the surrounding community for the city’s enjoyment. The movement began in 2010 and has seen cities all over the world including London, Lima, Providence (Rhode Island) and as of recently, Saint Paul, Minnesota. Through this movement, citizens of the Twin Cities planted several native plant species back into their environment on Pierce Butler Ave. The species planted conserve water, support the local wildlife and are resilient enough to withstand Minnesota’s weather conditions. In London, plants were planted within the Copeland community park. And in Lima, where this movement continues nearly every year, participants have marched in various parts of the bustling city to restore green areas. Lucia Monge, the creator of Plantón Móvil, began this as a way to address the lack of green due to increasing modern infrastructure. In hopes of creating a greener and healthier environment, marches like these promote awareness in your community of the green areas throughout the city. The Twin Cities has been a champion of promoting green infrastructure along our light rail system, maintaining green life and utilizing rain drainage. But this community can further their contributions by continuing support of the environment through protests like these. In many parts of the world, we’ve begun to see effects of climate change with disappearing deltas in Bangladesh or extreme disasters around the Caribbean. Climate change has already displaced individuals, destroyed homes, deteriorated health and livelihoods amongst various populations. Given the U.S.’s slow movement towards building a sustainable and clean future, it has fallen upon citizens to continue to voice our support for environmental friendly policy and promote sustainable lifestyles. To address climate change properly would prevent the hardships that vulnerable populations would face in the wake of severe catastrophes from climate change. A clean environment and health is a right for all people. It’s necessary to address climate change to preserve these rights. The wonderful movement of Plantón Móvil can be mobilized anywhere! It can be adapted to your community to raise awareness of the lack of green in your neighborhood. If interested in participating and facilitating your own march, you can reach out to Lucia Monge here and look for the “como participar” option to fill out a form.